This weekend is the first stop of the Axial west coast tour. 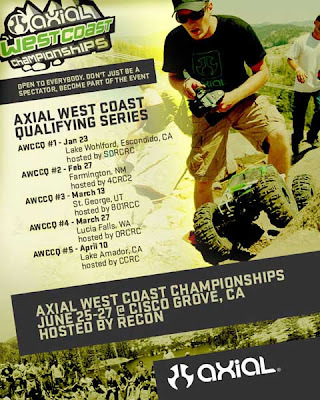 The winners of each class will be invited to Axial's West Coast Championship. Who will be crowned Axial King of 2010? I guess you will just have wait and find out. If you are around the area, come scope out the latest and greatest. Hopefully Axial will be showing off something new. By the way... Axial just bought an RV. It's going to be all wrapped up with graphics. Let's see what Greg (the marketing manager) at Axial came up with. Make sure you shake the RV a few times for us. Robert will also be there to hand out some Vanquish Products goodies. He has hats, shirts, and stickers. Go bug him!